Now that 2015 has officially arrived, it’s time to become the best writer you can be! Don’t fret; the Blue Moon Publishers team has compiled a list of four simple Writing Resolutions that will be easy to stick to! 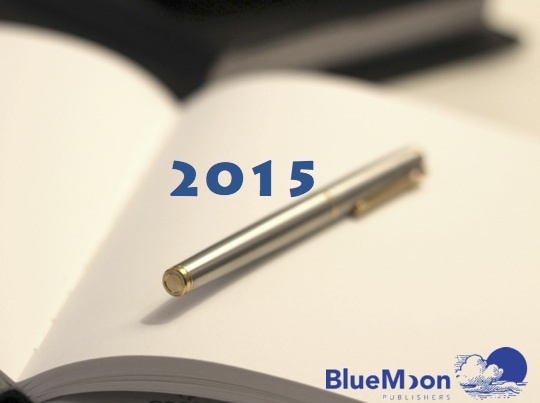 Don’t worry what it is you’re writing; just be sure to put pen to paper – or fingers to keys – every day during 2015. Your writing can be as brief as a haiku or as long as a novella, but it is important to keep the creative juices flowing daily. Some believe that writing a little bit every day is actually more beneficial than writing a lot all at one time, and it doesn’t matter when you write, either, as long as you find what works for you. And after all, five minutes spent writing can hardly be considered time wasted! Do you generally write realistic fiction? Give fantasy a whirl! Devoted to the short story? Why not try your hand at that novel! Writing in a new genre or style can certainly be a challenge, but it can be a highly rewarding experience, as well. You may find that you don’t like this new way of writing, or you may discover a hidden passion. Many writers are hesitant to show their work to others. They may fear criticism, or believe that their words simply aren’t good enough to be passed along. Sharing your writing may be scary, but it definitely has its rewards. A new set of eyes may find something that yours have missed, and an outsider opinion can be very valuable and even help to build confidence. In 2015, make it a goal to share your work with somebody whose opinion you trust; you have nothing to lose. Our final writing goal for 2015 is to read! Reading has been shown to improve overall writing and can be used for inspiration, motivation, and pre-writing relaxation. If you want to write like your favourite authors, you must familiarize yourself with them first. This is one resolution that we cannot wait to follow! What are your writing resolutions for 2015?